On May 16, 2017, the Florida 5th District Court of Appeal entered two decisions which affirmed, per curiam, three final judgments( for $2,500,000, $12,000,000 and $15,376,475 with accruing interest) and related orders if favor of our clients. After roughly four years of litigation and a three-week trial, a jury handed down verdicts totaling $14.5 million to Good Gateway LLC and SEG Gateway LLC, who were represented by Morgan & Morgan Business Trial Group attorneys Clay M. Townsend, Keith R. Mitnik, and John W. Dill. 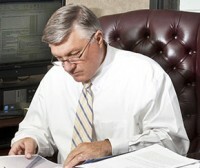 Clay Townsend is a member of the Morgan & Morgan Business Trial Group. This group of attorneys combine an extensive knowledge of traditional commercial, corporate, and securities law, with the legal savvy only gained from years in the courtroom. Clay Townsend has extensive experience in a range of practice areas oriented toward the legal needs of businesses, business people, property owners and personal injury clients. Put Clay Townsend and the Morgan & Morgan Business Trial Group to work for you! Attorney Clay M. Townsend has a long history of successfully guiding clients through commercial, entertainment and personal injury litigation. Protecting his clients’ business rights forms the backbone of his litigation practice. Clay has considerable bench strength in all requisite practice areas including entertainment law, intellectual property, real estate and business law. He also represents personal injury clients. Clay Townsend is a prominent Orlando attorney and member of the Morgan & Morgan Business Trial Group. The Business Trial Group represents businesses and individuals on a contingency-fee basis in all types of commercial disputes. They are experienced at handling lawsuits involving contracts, construction, employment, intellectual property, probate, real estate, securities, and other complex matters. If you are involved in a dispute that is heading towards litigation, our knowledgeable business attorneys will develop and implement an aggressive legal strategy designed to maximize your recovery, whether through negotiation, arbitration, or trial. If you are in need of legal representation please contact Clay for your free consultation!